Versatile formula that preps for coatings or protects on its own! Britemax Virtue SiO2 High Gloss Primer Polish is a silica primer finishing polishing that will remove light swirls and scratches while also leaving a high gloss finish, ready to be sealed or coated. Featuring a blend of durable resins that produce unparalleled levels of gloss and nano-tech quartz technology, Britemax Virtue SiO2 High Gloss Primer Polish will fully prep the surface for use with Britemax Amethyst Quartz Ceramic Coating and Britemax Igneous Quartz Ceramic Coating. Prepping the surface for a paint coating is just as important as the application of the coating itself. Many times it includes a two-step paint correction (depending on the condition of the paint) and can be very time consuming. Britemax Virtue SiO2 High Gloss Primer Polish was formulated to make the prep work just a little bit easier! By removing light swirls and scratches, while at the same time leaving behind semi-permanent fillers to create the perfect finish, Britemax Virtue SiO2 High Gloss Primer Polish will leave your painted surface ready for coating! Britemax Virtue SiO2 High Gloss Primer Polish doesn’t have to be used as just a prep product. Strong enough to stand on it’s own, Britemax Virtue SiO2 High Gloss Primer Polish will leave your vehicle’s surfaces protected and extremely hydrophobic for up to 6 months! For use with machine: Shake well. Clean and dry all surfaces. Using a polishing pad, dispense a liberal amount of product onto the desired surface and spread evenly using the face of the pad. Increase polisher speed and gradually reduce pressure. Work areas to desired finish. Buff and remove dried residue with a clean microfiber towel. For use by hand: Shake well. Apply a small amount to surface and rub in a circular motion with a polishing cloth. 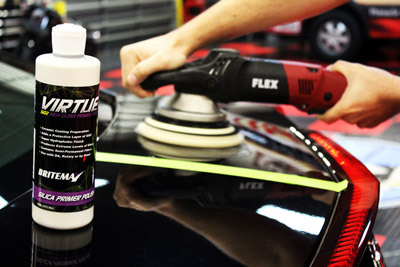 Buff dried residue off using a separate microfiber towel. Britemax Virtue SiO2 High Gloss Primer Polish 128 oz.